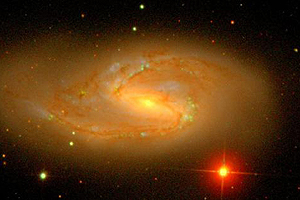 Messier 66 is one member of the Leo Triplet; the other members are Messier 65 and NGC 3628. Interactions with these other members caused the asymmetric, disturbed appearance of this galaxy. Dust lanes in the galaxy appear as dark bands running along the arms and elsewhere. The volume and scientific influence of Sloan Digital Sky Survey publications has grown over the years like a supernova's expanding cloud of gas and dust. Earlier this year, two astronomers at the Space Telescope Science Institute in Baltimore ranked the SDSS as the world's top-ranked high-impact astronomical observatory. Presenting their findings at a meeting of the American Astronomical Society, the institute's Juan Madrid and F. Duccio Macchetto ranked the top 10 high-impact observatories through an analysis of the 200 most cited papers published in 2004. SDSS research received 1,843 citations, followed by the European Southern Observatory with 1,365, and the Hubble Space Telescope, 1,124. The survey's influence also showed in a 2005 ranking of the 10 most-cited researchers in space science as determined by Thomson Scientific (http://www.in-cites.com/top/2007/fourth07-spa.html), a bibliographic database service. The top 10 included the University's Donald York and four SDSS collaborators affiliated with other institutions. “We pick good folks to work with,” said York, the Horace B. Horton Professor in Astronomy & Astrophysics and the College, who was the first director of the SDSS. Some of the most frequently cited SDSS papers describe the hardware, software and other details about how the survey operates. Others present new research findings on galaxy clustering, on young, distant galaxies called quasars and on brown dwarfs—gaseous objects not quite large enough to burn like a star. Until the SDSS came along, the discovery of a satellite galaxy near the Milky Way was comparable to the discovery of a new planet in the earlier days of astronomy. “The galaxies going around our galaxy, the satellites, were in that category, because they're very, very hard to find,” York said. One of York's students, Brian Yanny (Ph.D.'89), now an astrophysicist at Fermi National Accelerator Laboratory, accidentally discovered the first satellite galaxy in 2000, while looking for quasars. “It was complete serendipity. Nobody was looking for it,” York said. But since then, SDSS data routinely provide discoveries of satellite galaxies. Last January, Cambridge University astronomers announced the discovery of at least seven at one time. SDSS owes much of its success to the huge data volume it has amassed. “The more data you have, the more likely it is you can find an extremely rare object,” Kron said. The SDSS has collected data on nearly 200 million celestial objects, including galaxies, quasars, stars and asteroids. 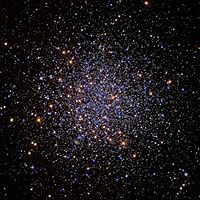 Although relatively sparse compared to other globular clusters, NGC 5466 still shows the strong central concentration, spherical shape and greater size that distinguish globular clusters from open clusters. Globular clusters are the oldest known structures in our galaxy, and globular cluster studies provide essential data for studying how stars age. “The database is organized and built in order to allow extremely efficient, very fast queries be put to it. This is something that I think is quite revolutionary,” he said. A cadre of astronomers has emerged to mine the survey's publicly accessible database for undiscovered marvels. “You can be at an institution that has no observatory at all and do cutting-edge research,” Kron said. Data volume also allows astronomers to find extremely subtle effects. “One of the things that we were anxious to do at the very beginning was to make inroads in the long-standing question of why it is that different types of galaxies cluster in different ways,” Kron said. Astronomers have noted clustering among massive galaxies lacking in recent star formation. At the other end of the spectrum, galaxies that show active star formation tend to have lower masses and are more evenly spread throughout the universe. “This is quite a puzzle,” Kron said. How could two phenomena taking place on such vastly different scales—from inside individual galaxies to vast stretches of the universe—be connected? But over the last few years, astrophysicists have managed to overcome significant computational difficulties to devise simulations that have begun to make that connection. And the SDSS database contains sufficiently detailed information to compare the results of those simulations to galactic and cosmological reality. Similarly, when the SDSS started, astronomers did not know if every massive galaxy harbored a black hole at its center, or if every quasar belonged to a galaxy. In both cases the answer is yes, with the crushing gravity of black holes squeezing and illuminating the hot gas of brightly shining quasars. But for unknown reasons, York said, the mass of a given galaxy's central black hole is correlated with the luminosity of the entire galaxy. The Hubble Space Telescope had found hints of this correlation based on observations of approximately 10 galaxies. Now the SDSS has done likewise for tens of thousands of galaxies. “It's absolutely nailed,” York said. SDSS astronomers also have nailed how rippling sound waves from the big bang left their imprint on the clumping of galaxies billions of years later. The University of Arizona's Daniel Eisenstein, the Massachusetts Institute of Technology's Max Tegmark and their associates mapped more than 46,000 galaxies over a section of the universe approximately five billion light years in diameter to find the effect. “It requires extremely large samples because it's a very subtle effect,” York said. Cosmologists had theorized that the big bang sent sound waves spreading through the early universe like ripples from a pebble thrown into a pond. Eisenstein, a former postdoctoral scientist at the University, and his colleagues found a clumping of galaxies on scales of 500 million light years, just as predicted. Gravitational lensing studies have opened additional avenues of SDSS research. Strong gravitational lensing, a component of Einstein's General Theory of Relativity, creates multiple images of a distant quasar as the gravity of an intervening galaxy bends light from the object on its way to Earth. “The wider apart the multiple images are, the more bending there is,” Kron said. SDSS astronomers have found the most widely split examples of gravitational lensing. The previous record were images separated by seven arc seconds, less than one-fifth the diameter of Jupiter as seen from Earth. The SDSS has documented gravitational lensing on a scale of 14 and 22 arc seconds. Initially, astronomers doubted that the SDSS telescope's optics would permit them to do weak-lensing studies. “Turns out that was another surprise. We could and did do it,” Kron said. In weak lensing, widely distributed lumps of matter slightly distort all images. But astronomers cannot see the distortion in their images. “It comes out of a statistical analysis,” Kron said. Just such an analysis by Chicago alumnus Tim McKay (Ph.D.'92), the Arthur Thurnau professor of physics at the University of Michigan, revealed dark matter halos as a pervasive phenomenon of galaxies. The study counters alternative theories of gravity that have arisen to explain discrepancies in the velocity of galaxy rotation. Mark up another highly cited study from the Sloan Digital Sky Survey.